I thought I'd celebrate my birthday today by making a pilgrimage to all of Mozart's notable November 9ths and the music and events associated with them. 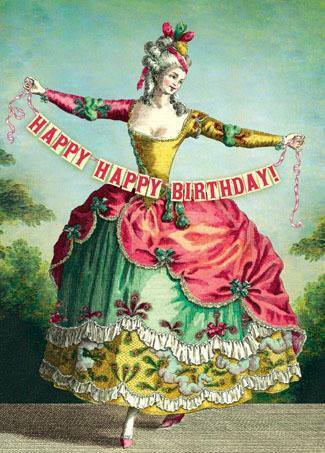 I've given the Mozarteum's Day by Day entries along with music links to our celebratory playlist! 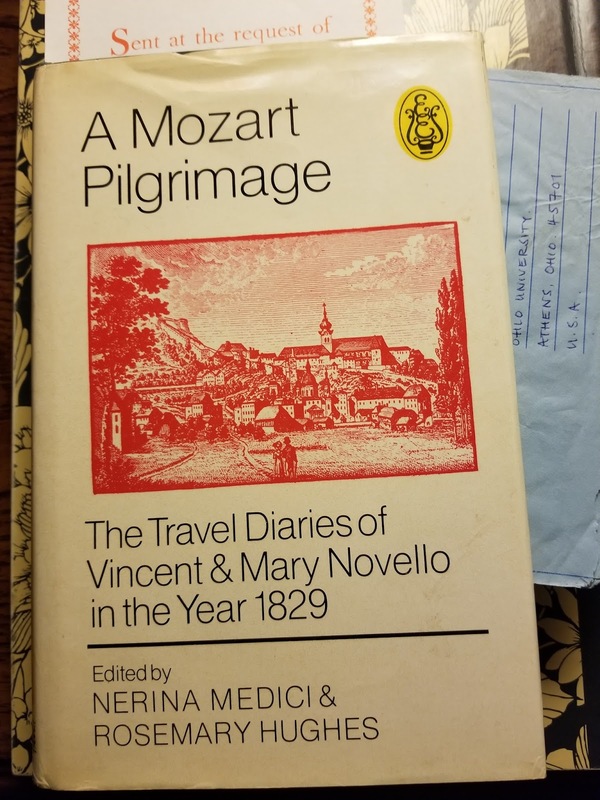 This birthday "pilgrimage" is inspired by the surprise I received in my copy of the book, "A Mozart Pilgrimage: The Travel Diaries of Vincent and Mary Novello in the Year 1829." Documenting the English couple's visits with Mozart's sister Maria Anna ("Nannerl"), his widow Constanze, son Franz Xaver Wolfgang and some of his closest friends, their diaries are "trenchant, blunt and revealing" (Sir William Glock, General Editor). 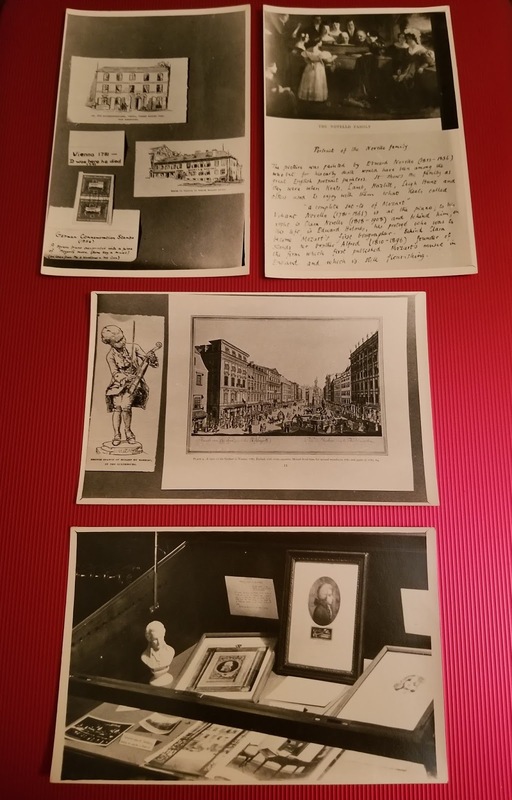 "A Mozart Pilgrimage" represents one of the earliest published accounts of music fans/admirers engaging in music heritage tourism and preservation through qualitative research and narrative history. When I placed my order, the book service mentioned that it contained postcards and a letter, but I couldn't have anticipated its contents! The letter was mailed with the book just a few days after I was born to the city where I was born: Athens, Ohio. It was sent from Oxford, England to the sender's Professor friend at Ohio University where I pursued my undergraduate studies in music and psychology. Incredible! The postcards, lending life to the Novello journey, were just as exciting to receive. The images are in black and white with handwritten captions. They're in pristine vintage condition. Subject matter includes a portrait of the Novello family and 1956 German stamps commemorating the bicentennial of Mozart's birth. Since the postcards aren't mentioned in the letter, I assume they were added later by the recipient. Were they curated from the Professor's travels? Did he find them in an antique shop? I wish I knew more! The book has its own story just like the one it contains. And I'm happy that, through this extraordinary encounter, we've crossed paths.